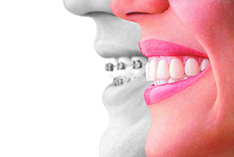 Our fee for Invisalign is similar to our fee for traditional braces. It is often the same. The fee depends upon the complexity of the case, the product ordered from Invisalign, the availability of insurance, and flexible spending plans. Invisalign offers several products for the doctor to choose from such as Express, Lite, Assist and Comprehensive. We typically recommend Invisalign Comprehensive because it does not limit the number of aligners a patient can receive during treatment. Some of these other options limit the number of aligners we receive. Therefore, your treatment is finished after the maximum number of aligners have been used with Invisalign products that are not Comprehensive. We offer a complementary consultation and at that appointment Dr. Markham will let you know if you are a good candidate for Invisalign and we will also provide you with a fee. Our fee covers your entire treatment including all visits, x-rays, scans of teeth, Invisalign fees, treatment planning, retainers, etc. Call us today at 215-491-5480 to schedule your complimentary consultation.